to talk about Super Street Fighter IV for the 3DS. As the conversation drifts from introductions to farewells, Ono discusses the importance of community and competition in fighting games, and gaming in general. 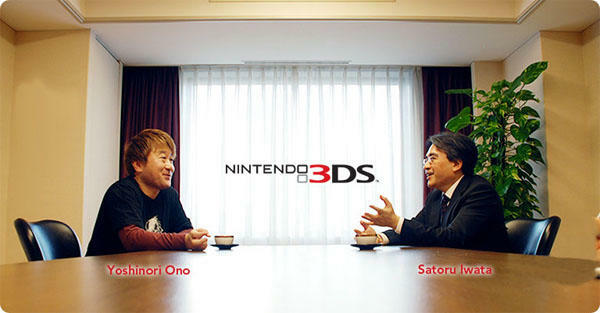 It starts when Iwata asks Ono to talk about his initial experiences with gaming. Ono points towards arcades in Japan and watching competition play out around him throughout the electronic playgrounds. He specifically makes mention of Japanese college students and their tradition of stacking 100 yen coins up on the console of an arcade machine to signify challenge and length of play. It’s something that’s done around the world. In the US, players will set quarters down on the machine for the same reasons. But Ono links this part of his childhood to gaming today. He explains that competition and longevity are all about community, and he offers that Super Street Fighter IV for the 3DS will include features that further spur and support the growth of the gaming community. Iwata brings up the spectator mode and voice chat that are included in Capcom’s upcoming fighter port, and Ono responds by citing the tech and functionality that comes with the 3DS and how that will provide a larger community. The one hitch with this plan, in my opinion, lies with Nintendo’s Friend Code system. It’s awkward. Part of gaming communities lies in identity. And adding friends based on a stream of numbers rather than a unique user name just about eliminates identity entirely. While the 3DS has features that circumvent this awkwardness, it’s always been disheartening to connect with friends through ID numbers rather than usernames. Super Street Fighter IV 3D Edition is part of the third party release roster for the 3DS due in the States on March 27th.